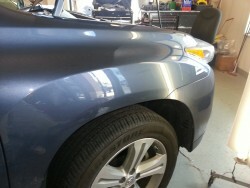 Many dents on vehicles can be repaired without body filler or repainting with our exclusive dent removal process. Using the latest technology and tools skilled technicians gently massage the metal back into its original shape from behind the dent. 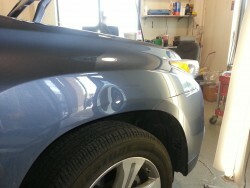 The dent is no longer visible once our technician completes the dent removal process. This process is extremely cost effective and convenient with many services starting at $55 and completed within a few hours. Dynamic Auto Detailing offers some of the best, most affordable dent removal services in the Des Moines area. With our exclusive dent elimination process, we can remove dents from your car without any repainting or refilling. Using the latest technology and tools, our skilled technicians can massage the metal back into its original shape and restore your car’s exterior to its original luster. Whether your car gets caught in a hail storm or dinged by another car door in a busy parking lot, we can remove the dent and make your car look as good as new. Our process is extremely affordable and effective – some of our convenient services are priced as low as $55, and only take a few hours to complete. You simply won’t find that kind of speedy customer service and reasonable prices at other auto body shops. We believe in being up front and fair with our customers, which is why we’ve been one of Des Moines’ premier auto detailing outfits since 1990. Dents hurt the resale value of your car, not to mention its aesthetic appeal. It’s important to get them fixed as soon as you can. We understand that dents happen – that’s why we offer competitive, very affordable pricing, and business hours that are friendly to your work schedule. Dent removal shouldn’t be a drawn out ordeal – we’ll get you in and out in hours, rolling out of our parking lot with your car as shiny and unmarked as the day you bought it.